Stop Wasting Time On Laundry! Time is your most valuable asset and it should be spent on important things you like doing, such as spending time with your family, meeting up with friends, and getting in a workout — not washing and folding clothes. My name is Steve Porada and I run New Bridge Laundromat here in Bergenfield, NJ. Yes, the rumors are true — we’ll pick up your dirty laundry, wash and fold it, and deliver it right to your doorstep for FREE! Our laundry pickup and delivery service is very easy to use. All it takes is contacting us to set up and schedule your laundry delivery service in Bergenfield or surrounding areas. Upon our arrival, we’ll give you one of our laundry bags with a name tag so we know it’s yours. Then, all you do is fill the bag with your dirty laundry and leave it outside your front door on Tuesday morning. My crew and I will pick it up and bring it to my local laundromat, where it will be carefully washed, dried, and folded to superior standards, then delivered back to your doorstep on Thursday. When you choose our laundry pickup and delivery service, you can elect to have a weekly laundry pick up, one every other week, one every month, or you can just call or text me as you need. We currently offer our laundry delivery service for residents in Bergenfield, New Milford, River Edge, Teaneck, Englewood, and Tenafly, and we only use premium laundry detergents such as Tide, Downy, and Clorox. We also take special requests, so please don’t hesitate to let us know if you require a laundry detergent for sensitive skin or one that is scent-free. At only $1.00 per pound of laundry, the price is very reasonable and the laundry pickup and delivery service is always FREE. Compare that to everything you spend now on washers, dryers, laundry detergent, special soaps, softeners, bleach, and most importantly, your time and energy. You deserve to enjoy your time off, and the savings will follow, so having us do your laundry makes perfect sense. 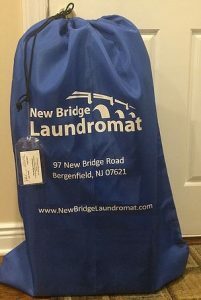 Contact us to set up your free laundry pickup and delivery service in Bergenfield and surrounding areas today!